Mansfield ISD has once again been named a winner of the ENERGY STAR Partner of the Year - Sustained Excellence Award. 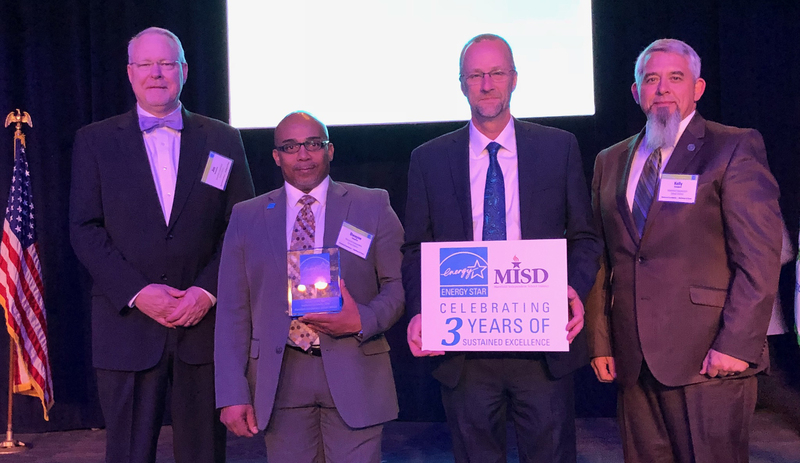 MISD is the only school district in Texas and one of six school districts in the nation to earn the distinction this year. The Partner of the Year Award is the highest level of recognition by the U.S. Environmental Protection Agency (EPA). The award is given to organizations that perform at a superior level of energy management and prove organization-wide energy savings. This marks the fifth straight year the district has won the award. Since the start of the MISD Energy Management Program in 2012, MISD has saved nearly $9 million in water, electricity and natural gas costs. The district’s conservation efforts have also prevented carbon dioxide emissions by 33,450 metric tons, an amount equivalent to almost 7,000 cars being driven for a full year. In addition, the MISD Energy Management Program educates students and families about the importance of turning off lights, closing doors and turning off water to promote conservation and sustainability. MISD has earned more than 300 ENERGY STAR building certifications since 2006, more than any other school district in the state. The district obtained its Sustained Excellence title in 2016 after winning Partner of the Year for the third consecutive time. The ENERGY STAR awards ceremony took place on Friday, April 20 in Washington, D.C.
View more information about the ENERGY STAR Partner of the Year Award.